Game description: This PS2 title features remakes of both original Atelier Iris predecessors. Gust has improved the visuals to PS2 levels, updated the mini games, made the voices clearer and reformatted the interface. Atelier Marie: Zarlburg no Renkinjutsushi gives you control of Marlone, an alchemist in training at the Zarlburg Alchemy Academy. With her terrible performance at school and no apparently hope of graduating, Marlone's teacher, Ingrid, gives her an ultimatum: make an amazing item within five years, or get kicked out of school. 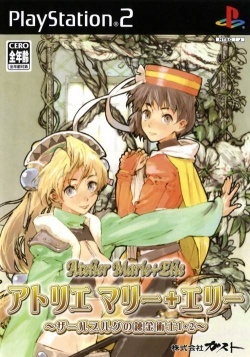 The second installment in the series, Atelier Elie: Zarlburg no Renkinjutsushi 2, gives you control of a young girl called Elfeel Traum who lives in the village of Robison. You end up being saved by Marlone (the girl from the first game) and head off to Zarlburg in hopes of meeting your hero once more.